William Woollard was 15 years old and only four foot nine inches tall (145cm) when he arrived in New South Wales on the Mangles in 1833 with a life sentence for picking pockets in London. He had two previous convictions. By July 1835 Woollard was assigned to C & F Wilson at Tocal, when he received 50 lashes for absconding and 50 lashes for neglect of work. One hundred lashes was a heavy punishment for a 15 year old. He was still at Tocal in April 1837 and evidently settled down because he earned his Ticket of Leave for the Paterson district in 1841. Although now free to work anywhere in the district, he continued his association with Tocal. In April 1845 he entered a ploughing competition at Maitland Show in the team of Charles Reynolds. Reynolds had leased Tocal from Felix Wilson the previous year. 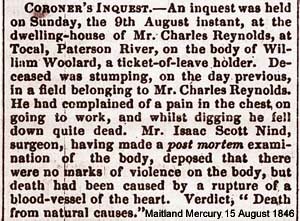 In August 1846, at the age of only 26, Woollard dropped dead while digging out stumps (stumping) in a Tocal paddock. It was a tragic end for someone rebuilding his life after a tough childhood.